In her spare time, there is nothing Pam enjoys more than getting her blood pumping with a game of tennis. You’ve probably seen Pam Golden Cezayirli (pronounced se-zar-li) around town. She’s the one that looks like a blur. Always on the go and always full of positive energy, no matter what Pam is doing, she’s enjoying every second of it. Whether it’s a morning walk, time with family or enjoying a friendly game of tennis, Pam is always making the most of life in Birmingham. Also, she can be found volunteering much time and energy with her church and good causes. She takes great pride in giving back to the community that has meant so much to her and her family. Nowhere is this desire to give back to the residents of Birmingham more evident, though, than in her career as a real estate professional. With a distinctly personalized approach, she is committed to doing whatever it takes to make every moment count for the families she works with. 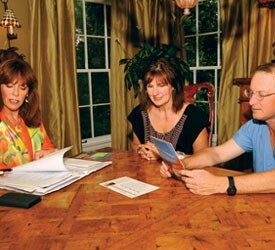 Pam pays close attention to your unique needs throughout your home purchase or sale. If you’re planning to buy or sell a home in the Birmingham area, make Every Moment Count with Pam Cezayirli. Her name may be hard to pronounce, but she sure is easy to work with. Give her a call today and get the most out of your real estate experience. Welcome to the new Oxmoor Village! Conveniently located to Red Mountain, downtown Birmingham, and everything Homewood. The Emerson plan is one of our most desired floor plans with its American Craftsman Bungalow design. This open floor plan features 3 bedrooms and 2.5 baths with the master and huge walk-in closet on the main level. 1 car garage accommodates main level entry. Gorgeous kitchen with painted cabinets, granite counters tops, an adorable shiplap island, tile backsplash, stainless steel appliances including a gas stove, and more. Hardwoods beam throughout the family room, dining, and kitchen. Call to purchase and customize your home today!